Is database backup compression enabled? How do I check if database compression is already enabled? Are remote admin connections enabled? How do I check if remote admin connections are enabled? How do I check if database mail is enabled? There was a time in the not-to-distant past where I had to pay for clean water to drink, from work, at work, to drink while on the clock. When did water become an optional business benefit? My initial thought was fairly obvious - "Why am I having to pay for clean water to drink at work?" On the one hand, it's reasonably priced, although unsubsidized, and on the other, what the ??? How is this not a basic business expectation to have clean water to drink, that isn't full of chemicals, etc? However, after a few weeks, what occurred to me was a little less direct: The other side of this equation is the impact on productivity - if people have to leave the workspace for basic needs such as water (or coffee!) - you might not like what they find while they're out. Because your competitors have figured out how to buy coffee. What did I do about X? Where did I put the answer to #1? To that end, I use two tools, which are Agent Ransack, and WinMerge - usually in that order, too, which is kinda backwards to the way I listed the logical questions, above. You ever notice that when you're looking for something, your search isn't logical? Yeah, mine too. 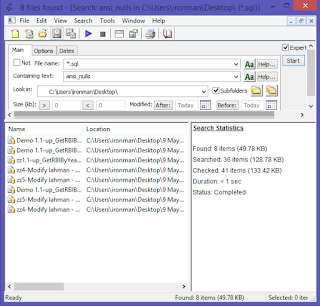 So, Agent Ransack lets me find just about anything in any folder on my computer, and it's quite fast at doing it. 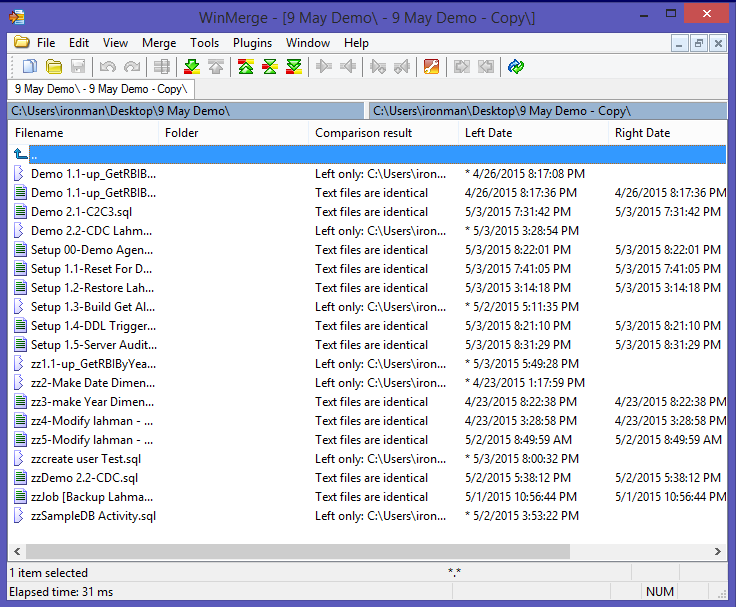 The other tool of interest in this search is WinMerge, which is especially useful in the cases where I need to answer Time - Over - Time questions. That is, what did I do about this problem the last time I solved it? So there's any number of ways to stay in sync with the developer next to you. The trick is finding out which one works for you. In this series of blog posts, I'm going to explore the more technical side of these equations. At my SQL Saturday session this past weekend, I had a great question about how to track Temp Tables - such as those made by a developer and never cleaned up. Using the test framework I had presented, I went back and tried it again, and no, they aren't tracked by the DDL trigger. However, it was possible to quickly and easily write a "capture everything" extended events session to record the SQL Statements that created them. With a little filtering, it would be easy enough to restrict that by database. 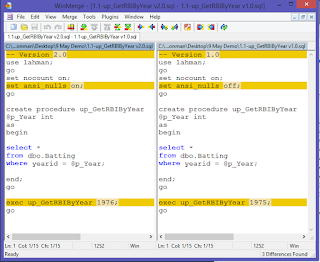 I'm really excited to be presenting this coming weekend in Baltimore (Columbia, actually) at SQL Saturday #395! netdom join isn't working - eh? wha? Every so often, I have to run SSMS against a host (or a VM ) that's in a different domain than the current PC/client that I'm on. 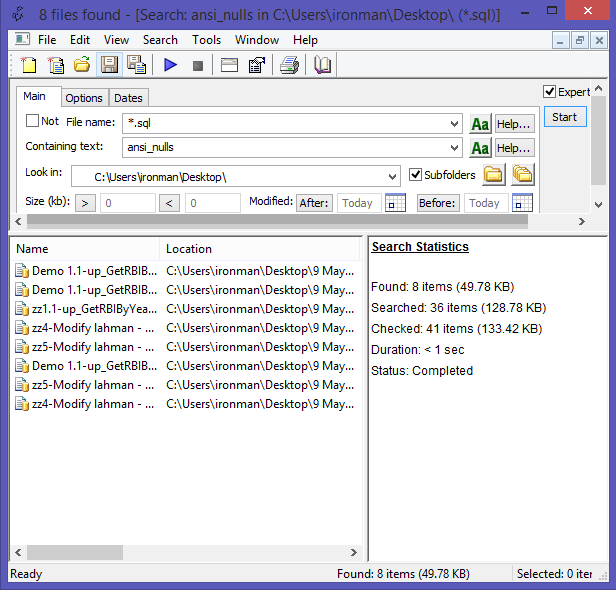 runas.exe /netonly /user:domain\username "C:\Program Files (x86)\Microsoft SQL Server\110\Tools\Binn\ManagementStudio\Ssms.exe"
Since, in whatever environment that is, I have to do this repeatedly, I create a shortcut on the desktop for it, and use the shortcut as the text above. Don't include your salary history. It's nobody else's business what you made. Even if you were government-employed, and your pay is a matter of public record, make people ask you for that information. Think of it this way - if you don't include it, and they ask, and they already know the answer (maybe they had that same job at that same pay grade, for example), and you tell them what they already know, then you've proven once again how honest and upstanding you are! This is putting the cart before the horse, and exposes your friends and contact list to potentially needless phone calls, *especially* if you put your resume on a publically searchable website. Employers care about the five W's , yes, but only after they've either skimmed your information or had it electronically scored, or both. I do suggest you address these things in your resume, sure, but do it as story telling, not as facts and figures. So, what's the point? Why do any of this at all? Why not just keyword up a version? Well, yes, and I recommend a keyword heavy version from a text-only resume point of view where you know your information is going to get scanned by searches (e.g. Monster, etc.). If you're going to craft a traditional resume, in any of its forms, then consider how you can tell a 2-3 sentence story for each position you've held, that answers one of these things. That said, the most important resume I have is my satisfied customers and my testimonials on my LinkedIn profile. The social network portion of your job hunt can't be overlooked - you know you're getting Googled before the interview, so make that work for you ! VMWare, Virtual Machines, and Viruses, Oh My! So I'm building a new set of lab machines again. They're going to be using Windows Server 2008 R2 and SQL Server 2012 as guests inside of VMWare's VM Workstation 9. 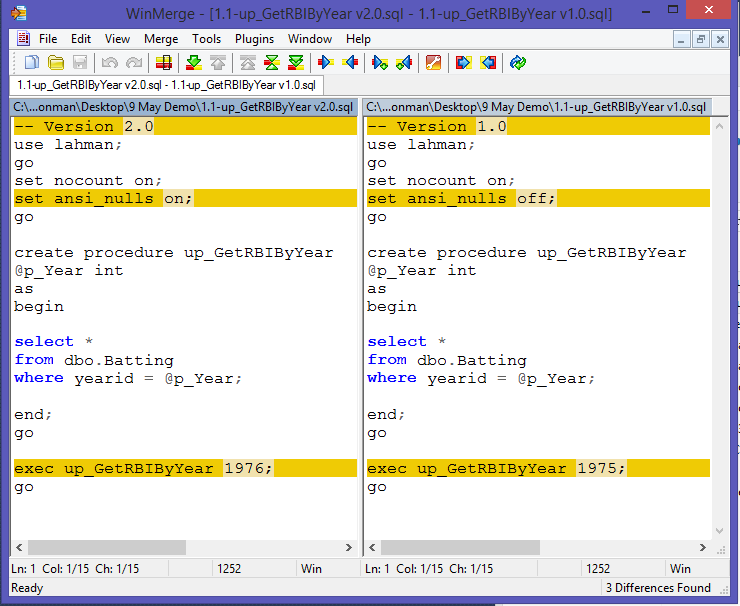 Visual Studio 2013 editor highlights the current line by changing the background color of the current line. By default, it's this hideously impossible to see also-black that looks like crud on my LED screen. Also, the fact that I'm using the dark theme means that also-black doesn't help when the highlight value is a grey value of 80% black. So I changed it from the default to Navy for Active, and Olive to Inactive.